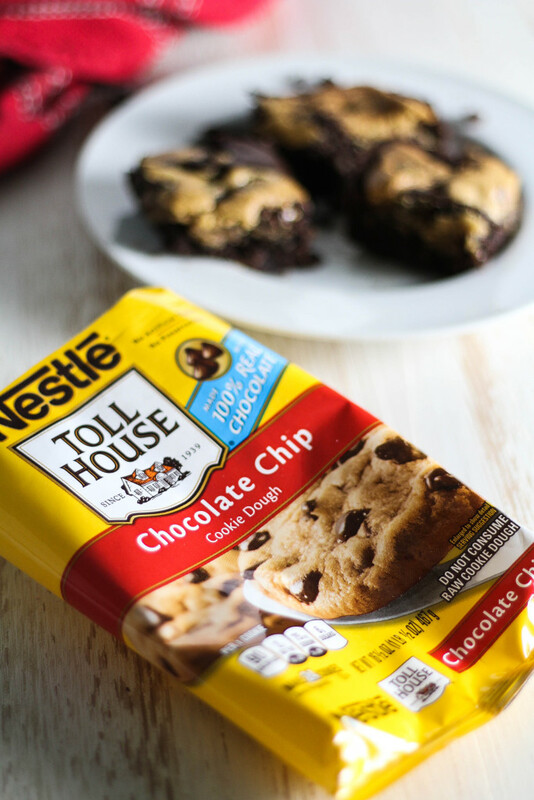 The ultimate dessert combination, these chocolate chip cookie brownies will have you wondering how you survived before this delectable sweet. All of my life, I have been the one in the family that counts down the days, hours, minutes and seconds until her birthday. This year, the year I turn 24, has been a bit different. Life has certainly gotten in the way. Now, it’s exactly 1 week before my birthday, and I can’t believe I’m saying this, but I forgot… Well, ok, let me slow my roll. I forgot, in comparison to years past. Usually it’s October and I’m obnoxiously stating “X DAYS TIL MY BIRTHDAY!”. This year was more like, “oh yeah my birthday is next week, wow”. Does that mean I’m an adult? Please say no. This year, Christian and I are celebrating my 24th with a mini-vacay to Charleston, SC, of which I will be reporting on later, of course. In addition to this little trip, and birthday celebrations with my family, of course I had to do a little something on this here bloggy blog, too. That’s why I’m coming at you today with the ultimate birthday dessert, sans birthday cake. One of my absolute favorite sweets, and I have a giant sweet tooth, is the good ole chocolate chip cookie. I am just the biggest cookie monster. 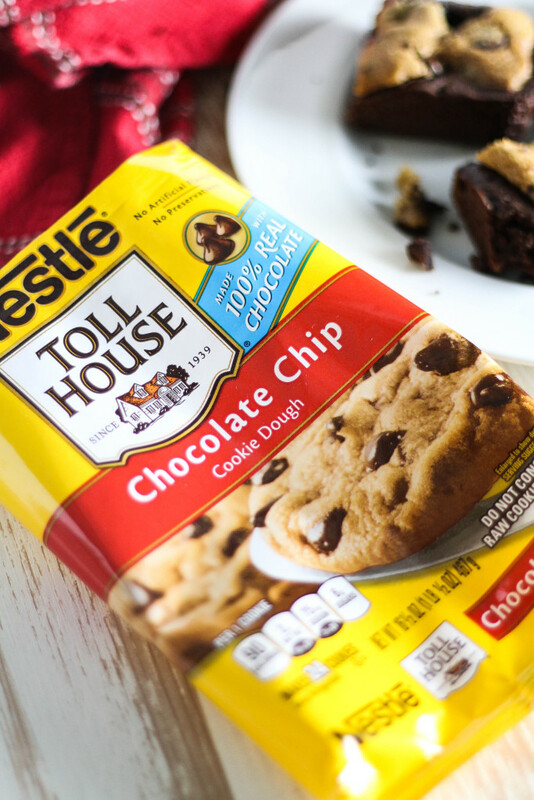 That’s why, when I had the hankering for some brownies, I decided to top ’em off with some NESTLÉ® TOLL HOUSE chocolate chip cookie dough to take my baking to the next level. And yes, the level was reached. This cookie dough has been my favorite since I was a little kid. It bakes so perfectly, the morsels are high quality and the milk chocolate melts in your mouth. 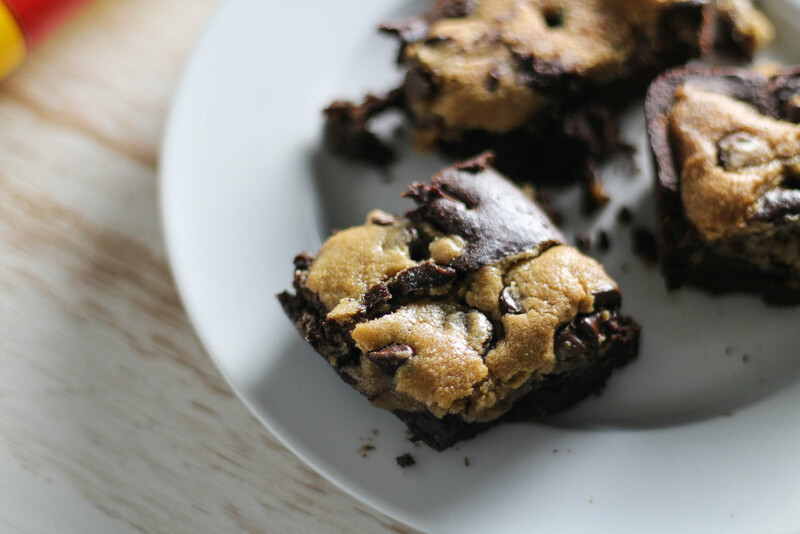 When combined with homemade brownies, the flavors are out of this world. I may or may not be actively trying to not eat the entire batch. Not only was this the perfect dessert for me to make in celebration of my birthday, but it’s definitely a great option to bring to your next holiday party. I promise, you’ll become the cool kid instantly (even though I know you’re already pretty cool). It’s like a Gosh darn dessert marble dream. These brownies aren’t your regular brownies… they’re, wait for it… black bean brownies. OKAY, BEFORE YOU WALK AWAY, they’re really effing good, so good that even my dad, the biggest advocate of gluten and general non-health foods, enjoyed them. K? Preheat the oven to 350 and grease an 8x8 baking dish. Place the black beans in a food processor and process until a paste forms. *Make sure you do not have any chunks! Add the chocolate chips, applesauce, egg, egg whites, and process until well-combined. Add the cocoa powder, sugar, vanilla and baking powder. Process again until mixed well. Break the cookie dough into chunks and flatten the pieces a bit with your hands. Place the pieces atop the brownie mix, trying to cover the surface area. Bake for 35-40 minutes, or until a knife comes out clean, depending on how you like your brownies. (I like mine fudgey, so I removed them when the knife came out mostly clean). ***These coupons are limited and only available while supplies last! Click here to redeem. What do you normally do to celebrate your birthday? Are you a ‘birthday week’ kind of person? I love that these are flourless! Happy early Birthday! 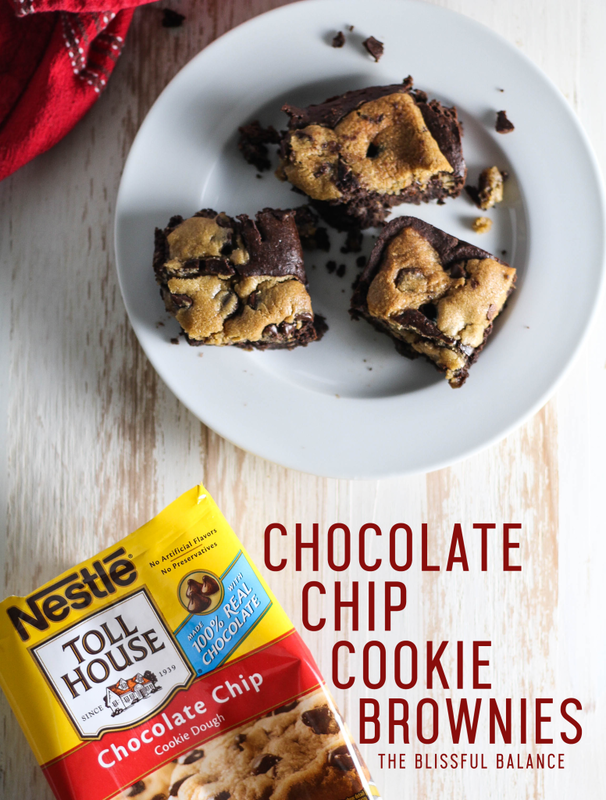 LOVE Nestle and these look delicious…Had to save it to my “Cookie Monster” board on Pinterest! I’ve been wanting to try black bean brownies, and these look absolutely incredible! Happy early birthday! They’re so easy to make, too!! Thanks Sarah! First of all, happy early birthday! Second of all, this dessert is the best of both worlds. 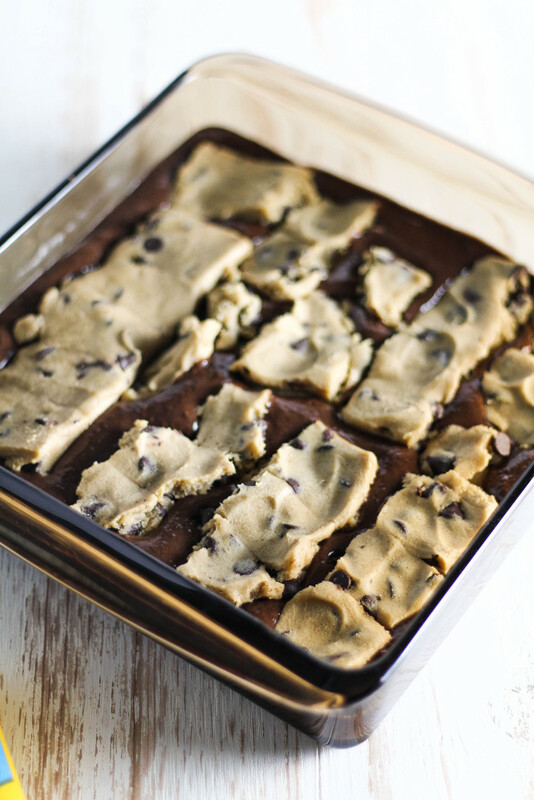 Cookie dough and brownies make the perfect combination! This year I have barely thought about my birthday because of graduation! Actually, I normally get more excited for Christmas and then after the post Xmas blues I remember my birthday is in 5 days. I love that your dad is an advocate of gluten. I could say the same thing about mine! Oh my gosh that’s perfect. And I thought having a birthday so close BEFORE Christmas was good! Happy early birthday! 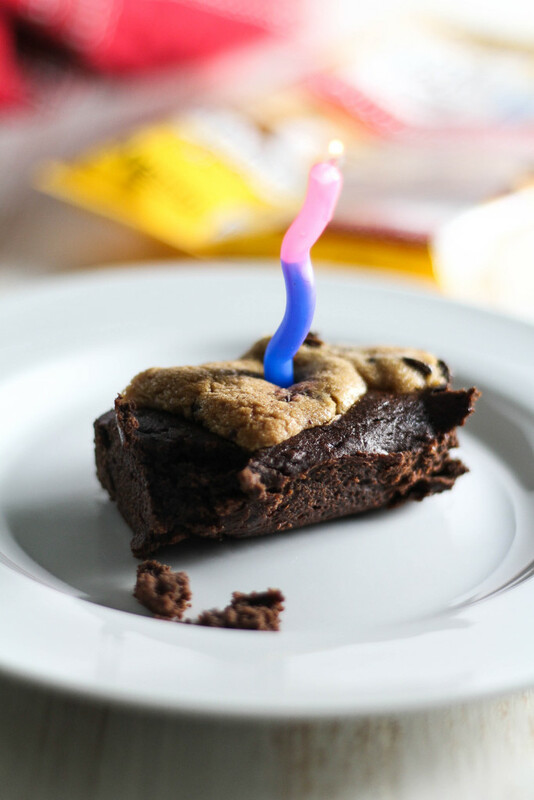 Screw cake, there is nothing like celebrating a birthday with dense fudgey brownies topped with all the cookie dough in the world! I would have never guessed that those are black bean brownie there, so dense <3. Hope you have a good time celebrating in SC! I remember you telling me you’ll be in Charleston!! CANNOT WAIT till you go. Please photograph all the things!! I had such a fun time…. I love thissssss. 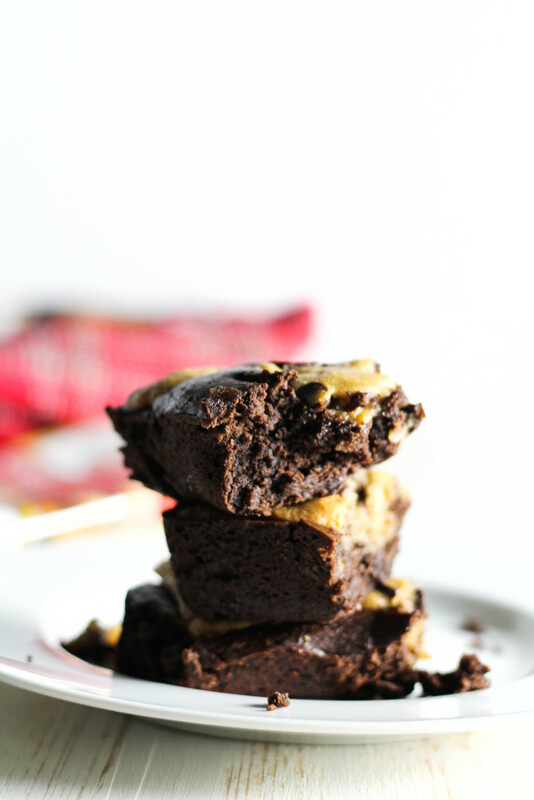 Healthy brownie bottom with traditional Tollhouse cookie dough on top?! Can’t beat that. But I truly love this mainly because our birthdays are 1 DAY APART. WE ARE BASICALLY BIRTHDAY TWINS. <3 I keep trying to think about what to make for my post!! I'm not a huge fan of cake either… unless it is like a coffee cake or something nontraditional. I could go for some pie… hm. Decisions, decisions. These brownies are the ultimate dessert! !